Must be Fusion Summoned. (Quick Effect): You can Tribute this card; destroy all monsters your opponent controls. If this card in your possession is sent to your GY by your opponent's card: You can target 1 non-Fusion Monster in your GY; Special Summon it. 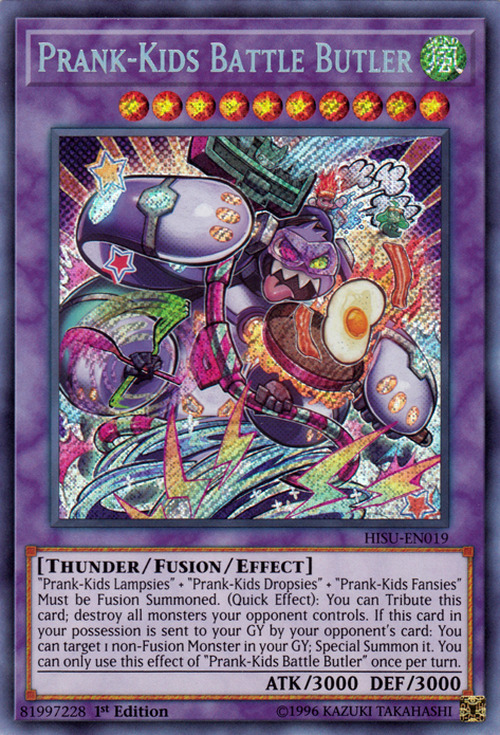 You can only use this effect of “Prank-Kids Battle Butler” once per turn. Prank-Kids Lampsies, Prank-Kids Fansies, Prank-Kids Dropsies appear in this card. 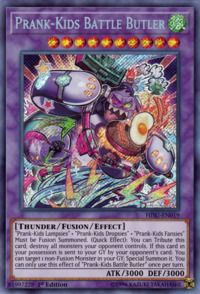 This monster normal form appears in the card artwork of Prank-Kids Place, Prank-Kids Pandemonium, and Prank-Kids Pranks. This card is tied with Hamon, Lord of Striking Thunder and Thunder Dragon Titan for the highest Level of all Thunder-Type monsters. Coincidentally, all three monsters have ATK equal to its DEF.